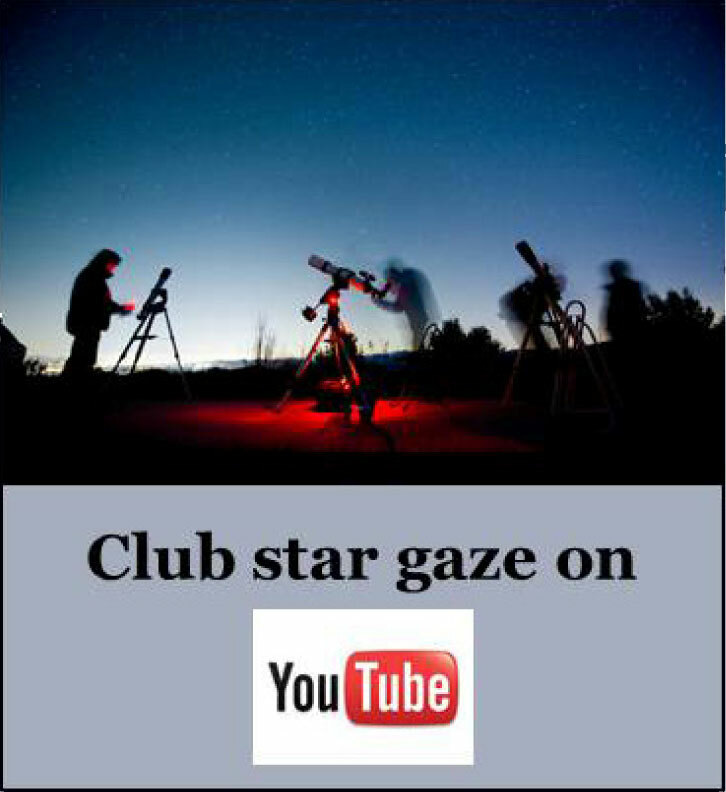 Unless otherwise indicated, our club star gazes are open to the public. They are usually, but not always, scheduled twice per month on the Friday nights that occur near the Last Quarter and New Moons (unless a holiday interferes). Should Friday night be clouded out, we normally use the next night (Saturday) as our backup night. The star gazes are held at Lookout Observatory, Grassland Mountain Observatory, or other locations in the area. We use a number of observing sites throughout the year based upon weather conditions and accessibility. To the right, find a list of our scheduled star gaze dates for the year. It’s not unusual for the club to conduct star gazes on additional nights during the year. 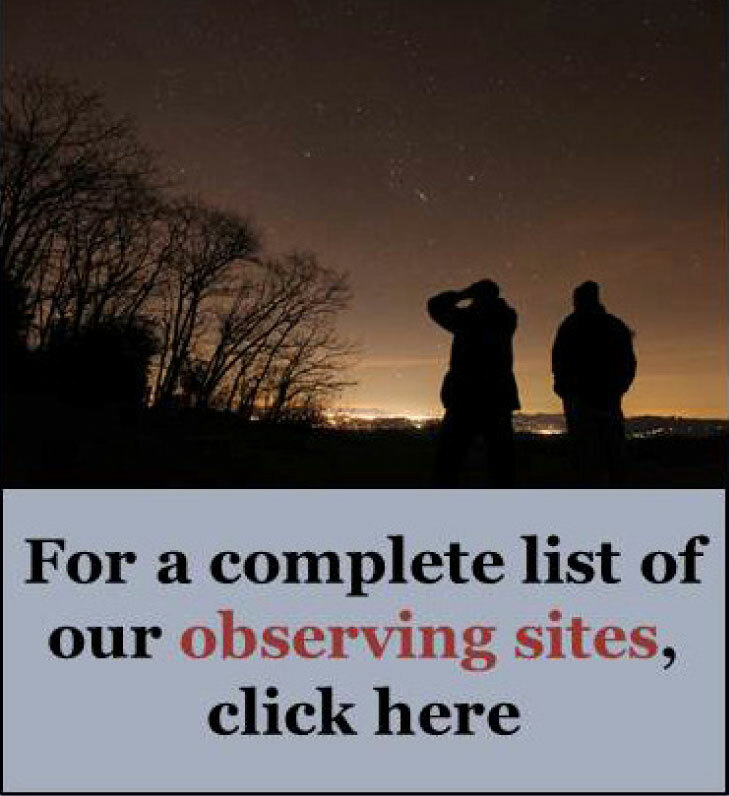 Check the “home page” regularly for the latest posting of upcoming star gazes along with their assigned observing locations, as well as possible postponements/cancellations due to weather conditions. Dress as warmly as you can, especially your head, hands and feet. We’ve never heard anyone complain about being too warm at a star gaze. We usually try to arrive at the star gaze a little before sunset. It’s good to have some daylight to set up the telescopes and not feel so rushed to begin observing. For those star gazes at locations other than one of the club-associated observatories, usually 5 to 10 people show up with telescopes. If the sky is clear a few people stay all night and won’t pack up until sunrise. Usually everyone just observes whatever they are interested in. We don’t have a fixed schedule. One person may be going after nebulae or galaxies, while someone else may just be getting acquainted with their new scope. Anyone who comes to a star gaze should turn off your car lights as soon as possible, and give warning before you turn on your lights to leave. Don’t use a flashlight unless it has a deep red filter over it. Few things irritate astronomers more than losing their night vision. It takes at least 15 minutes to get it back, longer if the person was observing very dim objects such as faint galaxies. While at the star gaze, don’t forget to breathe deeply. Low blood oxygen begins to reduce night vision in just a few seconds. Feel free to ask anyone what they are looking at and if you can take a look. Most astronomers love sharing their passion. But get permission before turning any knobs, such as that one you just know is the focusing knob. It may not be! Finally, please do not smoke or vape near the telescopes because smoke and vapor can coat the lenses and mirrors. If you do smoke or vape, please do it downwind and at a distance. Nature comes to the forefront at a star gaze. What a person looks like doesn’t matter (it’s too dark to see each other!). What matters is the shared enjoyment of the universe beyond our little blue marble. It takes you out of the workaday world and helps you realize there is more to the universe than this myopic view we have in the daytime.